A colleague shared the outcome of recent research into the efficacy of 1:1 laptop schools, more specifically it was a meta-analysis of 10 studies that examine the impact of laptop programs on students’ academic achievement. I read it with mixed feelings. 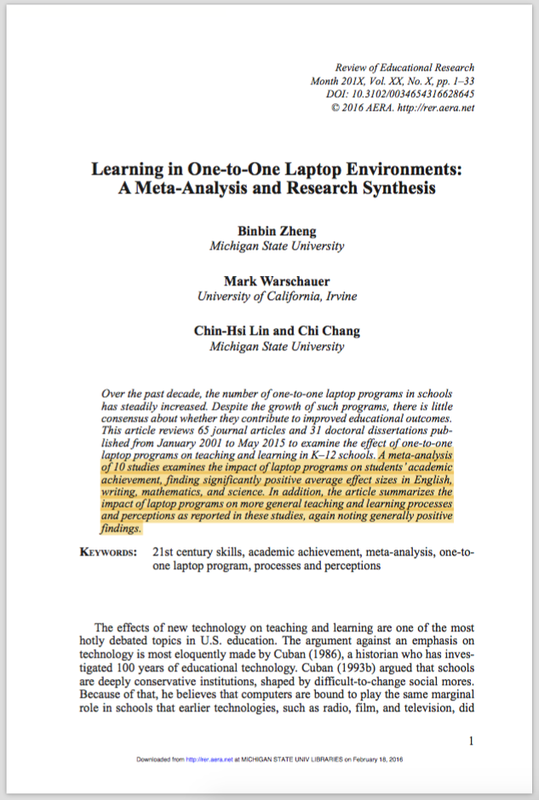 On the one hand the fact that the researchers concluded that schools where students have their own laptops see a "significantly positive average effect sizes in English, writing, mathematics, and science" was encouraging. They felt that "the impact of laptop programs on general teaching and learning processes and perceptions was generally positive". So that's good then. Right? So exactly what uses do they have in mind? How do they envisage these radically different affordances? 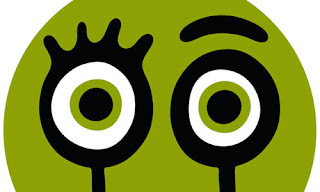 By inspiring the creative expression of learning through the exciting synergies between video, image, text, audio and the deft analysis and application of data? What? That's it? These devices hold the potential to radically transform their world, but let's just use them to type up reports (so they're nice and neat), Google stuff, and take online tests. So the measure of efficacy all boils down to that which can be measured on a standardised test. How depressing, and how inappropriate for a medium as rich as that of digital technologies. Like judging a ballerinas dancing ability, based on her spelling. So we use them ineffectively, then assess the efficacy of their use in ways that are utterly unsuitable. Is this really what we expect when we talk about 'technology enhanced learning' in 1:1 environments? I sincerely hope not. I tell you what though, it would make my job a lot easier if I did. I have to wonder whether the corporate world is as obsessed with trying to validate the influence of digital technologies in the workplace as we are with attempting to defend them in the classroom? Do any of us really believe that the corporate world would be better off without digital technologies? Then why would we would we believe that classrooms would be better off without them? Do we really believe the corporate world would spend the millions if not billions it must cost every year to maintain their IT infrastructures if they did not feel they was essential, important, effective? As it is I'm not prepared to settle for a lowest common denominator approach, where we abandon any attempts at using these devices anywhere near their potential, and instead settle for using them in the ways that are the easiest, and therefore the most common, even if they are far from being the most effective. By easiest/least I mean ways of working that most closely replicates the traditional approaches to learning that were the norm before the advent of the digital revolution; writing becomes typing, and researching in the library becomes Googling, the results of which we present, in writing. That's it. Vitamin D[igital] Video, Image, Text, Audio, Data. VITAD. No, these laptops should be used to create in all five domains, not just text, but image, video, audio and data, and all sorts of overlaps between them. These technologies should exploit all of the attributes that digital tools excel at; situated learning/working, access to global communities/experts, multimodal artefacts, mutable work flows, sharing and collaborating on content using social networks. But the truth is that if all they are exploiting is their use is as word processors and web browsers, these machines are definitely underused. I guess this could be described as giving up on transformation and focusing on amplification instead, if I'm honest, is this a bad thing? It would certainly make my job easier... Maybe having tech being oversold and underused is better than having them ignored and unused. I guess the question that I need to wrestle with is, if I need to lower my expectations... Maybe if we just focus on using one domain effectively (text), we'll still see benefits in terms of learning, but perhaps more effectively and consistently—less is more? Perhaps, but I doubt it; focusing on just one domain out of five strikes me as making as much sense as buying a car and using it to keep you dry in the rain, or cool in the sun. Zheng, B., Warschauer, M., Lin, C. H., & Chang, C. (2016). 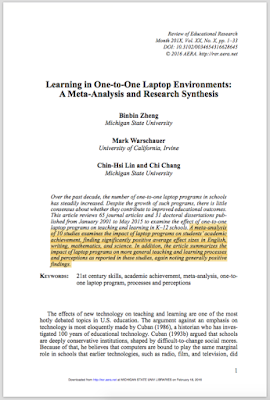 Learning in One-to-One Laptop Environments A Meta-Analysis and Research Synthesis. Review of Educational Research, 0034654316628645.